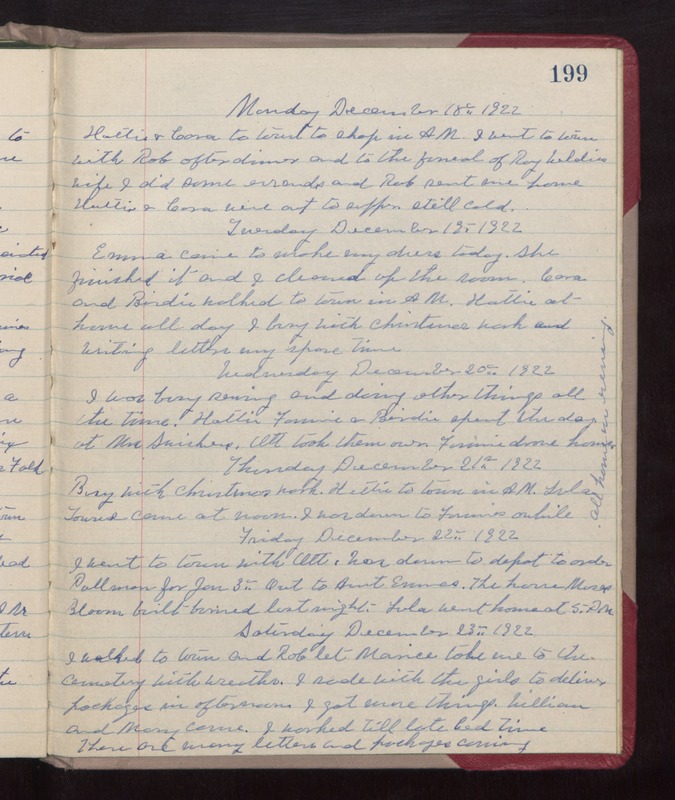 Monday December 18th 1922 Hattie & Cora to town to shop in AM. I went to town with Rob after dinner and to the funeral of Roy Weldies wife. I did some errands and Rob sent me home. Hattie & Cora were out to supper. still cold. Tuesday December 19th 1922 Emma came to make my dress today. She finished it and I cleaned up the room. Cora and Birdie walked to town in AM. Hattie at home all day. I busy with Christmas work and writing letter my spare time. Wednesday December 20th 1922 I was busy sewing and doing other things all the time. Hattie, Fannie & Birdie spent the day at Mrs Swishers. Ott took them over. Fannie drove home. Thursday December 21st 1922 Busy with Christmas work. Hattie to town in AM. Lula Towns came at noon. I was down to Fannies awhile. All home in evening. Friday December 22nd 1922 I went to town with Ott. Was down to depot to order Pullman for Jan 3rd. Out to Aunt Emmas. The house Moses Bloom built burned last night. Lula went home at 5 PM. Saturday December 23rd 1922 I walked to town and Rob let Maurice take me to the cemetery with wreaths. I rode with the girls to deliver packages in afternoon. I got more things. William and Mary came. I worked till late bed-time. There are many letters and packages coming.